Jason Craven, the owner of Desert Rat Excavating, Inc., has been excavating for over 30 years. So he understands contractors and builders, and he understands excavating. That’s what has helped him build Desert Rat Excavating, Inc. into one of Arizona's top full-service excavating companies. Whether you live in Show Low, AZ or the Phoenix Metro Valley, from foundations, basements and utility preparation to roads, driveways, drainage, and land contouring; from retaining walls and forest management (including land clearing) to sewer and septic installation; demolition and winter maintenance to commercial services or parking lots. Desert Rat Excavating, Inc. takes pride in exceeding all expectations. 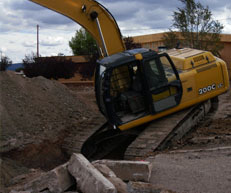 As one of Arizona's premier excavators we can meet every aspect of your excavating needs. At Desert Rat Excavating, Inc. we are always looking for new challenges and enjoy being a part of your excavating, land management, demolition, or sewer and septic projects. We will listen to your needs, work with you to tailor your job exactly as you desire and in the process do everything on our part to exceed your expectations. Desert Rat Excavating, Inc. strives to consistently deliver Experience, Expertise & Excellence. Please give us a call at (928) 205-9678 or contact us to find out more about our service or to schedule a meeting to discuss you excavating needs. Our primary excavation services territories include Apache County, Coconino County, Gila County, Maricopa County, and Navajo County. When our clients need help on excavation, construction or demolition projects, they know they can rely on Desert Rat Excavating, Inc. to get the job done on time and done right the first time. No Excavation Job's Too Big!